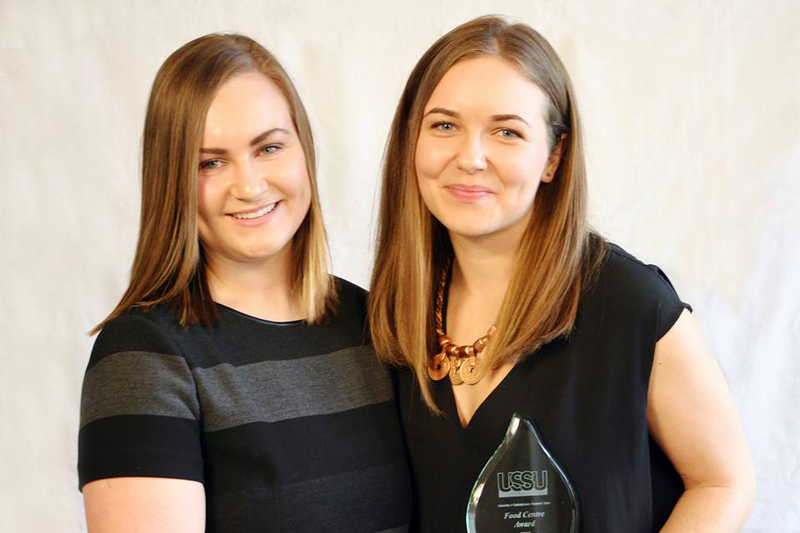 Congratulations to nutrition students Lauren Kapphahn and Tenielle Koob who received University of Saskatchewan Students' Union (USSU) Experience in Excellence Awards on Sunday, April 3. Lauren received the Food Centre Award from the USSU. She has volunteered for the Food Centre for two years, helped run the weekly Fresh Market since September of 2014, and participated in the city-wide Trick or Eat Food Drive on Halloween 2011, 2014, and 2015. The award was presented by Taletha Bennett, fellow nutrition student and outgoing USSU Food Centre coordinator. The Food Centre was established in 2003 in direct response to hunger on campus. This award is presented based on four fundamental criteria: enthusiasm, dependability, knowledge, and participation. Tenielle was one of four students selected for the Vera Pezer Awards for Student Enhancement. She was the Saskatchewan Pharmacy and Nutrition Students Society liaison to the University Student Council for 2015-16. Tenielle sat as chairperson of the newly struck Council Commission, which investigated and made recommendations to increase female Executive member representation in the USSU. Among her many other accomplishments, Dr. Vera Pezer, former Chancellor of the University of Saskatchewan, was once the Associate Vice-President of Student Affairs and Services. In that capacity, Dr. Pezer recognized that to embrace the full University of Saskatchewan experience meant embracing a broader scope than the classroom alone. The USSU Executive established the Vera Pezer Awards for Student Enhancement in order to celebrate and acknowledge the many volunteers our campus. The purpose of the USSU Experience in Excellence Awards is to show appreciation for those individuals who strive to enhance the student experience at the University of Saskatchewan. These individuals demonstrate that one person can make a difference and bolster the image of students, staff, and the university now and into the future.